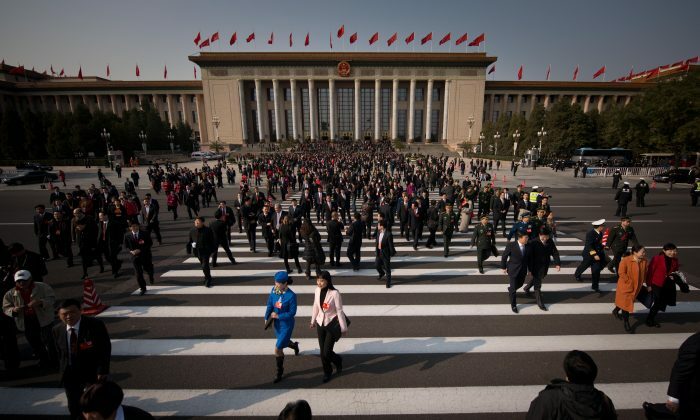 If plenty of cadres are already openly renouncing, or quietly wandering away from the Chinese Communist Party anyway, why not make quitting an official option, and save the regime a bit of face? A Party-affiliated academician in China proposed an idea along these lines in an ideological journal recently, suggesting that the Party cut its membership by almost half, to avoid losing control like the Soviet Communist Party in 1991. Independent experts looking at his proposal, though, say the system is already unraveling, and it won’t help very much. Writing in a biweekly journal run by state mouthpiece People’s Daily, professor Zhang Xien at Shandong University warned that the Chinese Communist Party’s (CCP) bloated membership of 83 million needs to be reduced to 51 million for it to survive. This last remark refers to the fact that many Party members today do not take the organization’s official ideology very seriously; membership is often seen simply as a means for career advancement. Accounts online of Party “study sessions” over the last few years often recount the experience in disparaging terms, with widespread lack of interest from the rank and file in the latest theoretical developments of Party leaders. The impenetrable doctrines of previous leader Jiang Zemin, the “Three Represents,” or Hu Jintao’s “scientific development concept,” are regularly ridiculed. Shi Cangshan, an independent analyst of Party affairs based in Washington D.C., told The Epoch Times that the suggestion to “purge the Party” reflects a range of issues facing the CCP. There are the diehard Party organizers, for example, who wish to reorganize the Party’s Byzantine structure, which has become a headache for local committees to manage internally. “Currently the Party has 83 million members, and from the central to the local level it has 13 levels of horizontally organized Party-construction organs, which each have their own countless vertical organizational arrangements,” he said. Another issue is the phenomenon of “geriatric politicking,” where ex-leaders continue to meddle in Party and state affairs, even after they have supposedly quit or retired. Shi said that former leader Hu Jintao took the lead to “naked quit” at the 18th National Congress last November, which makes it more difficult for previous Party chief Jiang Zemin to continue his role in influencing Party matters. “In the past, all the retired high-level Party members had no problems with manipulating Party affairs or activities at their levels after they retired. Especially for the generations of Deng Xiaoping and Jiang Zemin–they retired but didn’t quit, which created a lot of complications for the new incumbents,” Shi said. He added that by making retired veterans’ membership “honorary,” as set forth in the article, such people can no longer influence decisions inside the Party. Shi noted that the CCP’s foundation is “already extremely shaky,” explaining that there are many passive and inactive members, known as “rightists” by the more ideologically committed, who doubt the Party’s ideology and system. The proposal by the Party scholar acknowledges that about 8 million members or 10 percent of the membership can be cut by purging these “passive” cadres. “This has a direct relationship to the Tuidang [quit the Party] activities which have been unfolding for years,” Shi Cangshan said, referring to a grassroots movement whereby members and former members of the Party and its attached organizations—the Youth League, and the Young Pioneers—are encouraged to renounce their membership. The Chinese edition of The Epoch Times keeps a running total of the number of people to have renounced the Party. An online poll by a Chinese state media showed people have low confidence in the Communist Party's leadership and reform policies.